A typed, object-oriented, temporal constraint system is presented. The constraint programming paradigm is based on temporal Horn clause logic. If differs from executable temporal logic programming paradigms in that it is typed, object-oriented, and equipped with access support for persistent objects and an optimizer. The constraint language is expressive enough to capture a variety of non-trivial applications with no need for procedural decomposition of methods. Temporal query facilities fit naturally into the presented object-oriented constraint paradigm. The low-level part of the implementation model for persistent objects is based on access relations and the supporting algorithms. 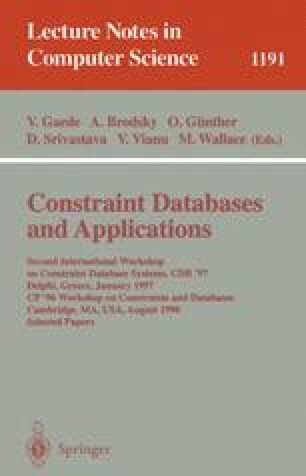 An optimization technique for temporal queries presented in the paper is a generalization of the existing optimization techniques for object-oriented and logic databases. This material is based upon work supported in part by the U.S. Army Research Office under grant no. DAAH04-96-1-0192.